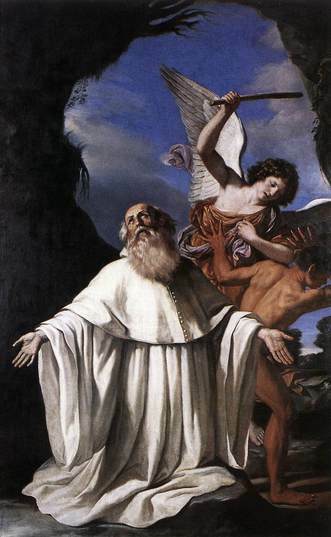 Guercino painted this scene from the life of Saint Romuald in 1640-41. The holy abbot is kneeling in prayer in his grotto, having just been delivered from a fierce diabolical temptation. One sees the devil, in the form of a swarthy, naked youth with pointed ears and long pointed fingernails and toenails. The Angel of the Lord, armed with a sturdy stick, is driving the tempter away. The face of the Angel is illumined by the same divine radiance that shines on Saint Romuald in prayer. The devil averts his face from the light and turns his back on the presence of God. The greatest saints were subject to violent temptations and diabolical molestations. One has only to read Saint Athanasius’ Life of Antony to get a clear perspective on the subject. The crucible of temptation is indispensable to holiness. It makes one aware of one’s utter dependence on the grace of Christ. It obliges one to persevere in prayer. It exercises the theological virtues, especially that of hope. It is humiliating: that is, it makes one humble. Satan adapts his temptations to our particular weaknesses and circumstances. This is why people without a good self-knowledge (the ground of humility) so often fall prey to his strategies. That being said, one of Satan’s classic ploys, always and with everyone, is to try to bar the way to the pierced Side of Christ. The Accuser seeks to intimidate, discourage, or distract souls from the Sacred Heart. This is one of the reasons why Satan, the original iconoclast, so hates representations of the Sacred Heart and of the Wounds of Christ, particularly of the Wound in His Sacred Side. The glorious Heart of Jesus, opened by the soldier’s lance on Calvary, remains open in the adorable Sacrament of the Eucharist. By keeping souls from the Most Holy Eucharist, the Evil One keeps them from the Heart of Jesus, the fornax ardens caritatis, the burning furnace of charity. Separated from the Eucharistic Heart of Christ, souls grow lukewarm, then cold. Those who are deceived into remaining far from His Eucharistic Heart will find themselves frozen in their sin. The grace of prayer, in all its forms, is an approach to Our Lord’s wounded Side. All prayer has a Eucharistic finality. It is in the Eucharist, as on the Cross, that Christ is lifted up in His oblation to the Father. It is in the Eucharist, as on the Cross, that from His pierced Side flows the blood and water of redemption. “And I, if I be lifted up from the earth, will draw all things to myself” (Jn 12:32). 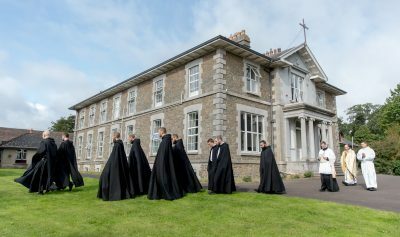 The saints are those who, having yielded to the sacramental embrace of the Crucified, drink from His open Side and find refuge in His Sacred Heart. It is not by happenstance that souls devoted to the Sacred Heart are drawn to Eucharistic adoration. Satan’s first and last temptation will always be to keep one from praying. One who prays is saved. One who stops praying will be lost. One who prays is never far from the pierced Side of Christ. One who prays will experience the mysterious and sweet attraction of His Sacred Heart. One who stops praying will become cold and indifferent to the Eucharist and, by the same token, alienated from Our Lord’s wounded Side. This is where consecration to the Blessed Virgin Mary comes in. I have never known a soul consecrated to Mary who has altogether abandoned prayer. Even if, at certain moments, prayer is interrupted or ceases materially, during those moments the prayer of the Mother supplies for the weakness of the child; the outstretched mantle of her ceaseless intercession covers those who have entrusted themselves to her Immaculate and Merciful Heart. Souls consecrated to Mary are not spared temptation, but they are assured of mercy and “find grace in seasonable aid” (Heb 4:16). The Blessed Virgin Mary presents all who approach her the Sacred Heart of Jesus. “Likewise the Spirit, through the Immaculate Heart of Mary His Spouse, also helpeth our infirmity. For we know not what we should pray for as we ought; but the Spirit Himself, through the Sorrowful and Immaculate Heart of Mary, asketh for us with unspeakable groanings. And He that searcheth the hearts knoweth what the Spirit desireth; because He asketh for the saints, through Mary, Mediatrix and Mother, according to God” (Rom 8:26-27).